As Christmas is creeping up on us, it’s a time to relax and celebrate with friends and family for the world over. Most of us will defiantly be stressing out over what to wear to the works party or for festive drinks with friends, but relaxing in your home with your loved ones is an equally good opportunity to look fabulous. During the Christmas period I’m sure we all get a little tired of speaking to relatives we don’t see all year and your siblings or any other family member for that matter start to drive you insane, but at least this year you’ll be looking good rocking the most gorgeous ‘winter comforts’ of the season. As it is winter, we are embracing knit wear the world over even if you’re lucky enough for it to not be a necessity it’s a big look. The winter comfort look is all about focusing on big knits teamed with cute feminine pieces, you’ll want to parade the streets in your pyjamas by the time you’ve finished styling your ultimate Christmas eve and morning look. The primary factor of winter comforts aka ‘lounge wear’ is comfort, but as all fashionistas know, comfort means anything but boring. With Burberry offering some great examples of staple knit wear featuring their world famous classic print, their knit wear should be the top of your Christmas list- so get on to Santa while you still have time! This piece will carry you well into the New Year with the popular argyle check detailing and oversized fit, it’s perfect for lounging around your house and being 100% cashmere too, you’ll be relaxing in the most luxurious sense. Mixing designer with high street is one of the best ways to achieve the effortless look this Christmas, and with one of my personal favourites having an entire range dedicated to this type of clothing it was only right that Topshop joined the British fashion giant Burberry in this featured look. As the cardigan is quite oversized, keeping the rest of the outfit cute is important, keeping it simple with this gorgeous gothic inspired red playsuit with lace detailing gives a real twist on traditional playsuits. By adding some thick either knee high socks, or the pair featured from Topshop too will keep you warm and looking on trend. Tying in the cardigan detailing with the socks similar pattern to complete this effortless ‘I’ve just rolled out of bed and look fabulous’ look. Playsuits and jumpsuits have been staples this season, and now they have been bought to us in a simplified form to keep us fabulous relaxing around the house and in bed. 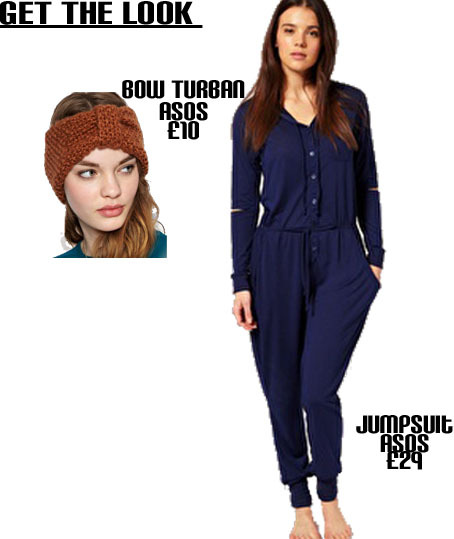 This gorgeous piece from ASOS will keep you super warm and fabulous this Christmas. With cut out detailing on the elbow and metallic buttons, it’s almost too good to wear to bed! To style it up why not add some chunky knit accessories, they’re not just for outdoors. Adding a knitted bow turban in a lovely rustic burnt orange colour will bring a real high fashion twist to the outfit, making even Santa envious of your head wear! If you’re not feeling quite so daring to brave the gorgeous head wear indoors, why not try some more twists on the traditional pyjamas, either adding accessories to sets you already own or mixing and matching old with new. Try some short shorts, with cute lace detailing very on trend with over the knee socks to keep you warm and looking fabulous. Add a simple knitted jumper for an effortless look, much more fun than boring plaid pyjama’s. Another take on a simple look is to add coloured leggings with a crop top, this gorgeous patterned poncho inspired crop wrap over from Topshop can be worn either over a simple vest top or brave the look on its own for a catwalk look. Team with block coloured leggings for comfort and style. If you want to go for a more plain style, why not add a chunky knit cream or light pink cardigan. Whichever Christmas eve and day look you choose to go for this Christmas, you’ll be looking fabulous! STAFF CHRISTMAS PARTY - WHAT TO WEAR? THE GIANT ZARA OPENS IN ROME, AND IT'S ECOLOGICAL!